While most moms spend their entire pregnancy worrying about how and what to feed their newborn, they often neglect themselves. While baby is fortified with breast milk and organic mashed veggies, mom has the number of the nearby Domino's memorized. Lucky for new moms and dads, there's Debbie Koenig, proud mom of 5-year-old Harry, and author of the remarkably useful new cookbook, Parents Need to Eat Too. The idea for the book grew organically from Koenig's own life. As a sleep-deprived new mom, she found herself resorting to too many fried egg sandwiches and Clif bars instead of nutritious homemade meals. So she started making a few changes: During Harry's morning and afternoon naps, she'd chop and roast vegetables or whip together a cheese or tomato sauce so that when dinnertime came, she'd be way ahead of the game. Miraculously, it worked! So well, that you're now reading this review of her cookbook. 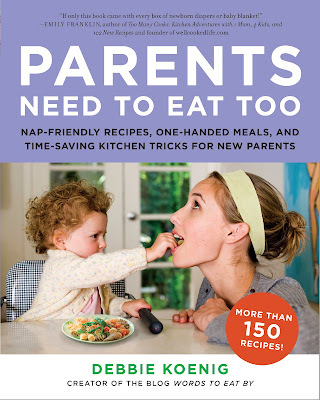 Parents Need to Eat Too has over 150 delicious, nutritious, easy-to-make recipes divided into creative chapters including "Nap-Time Cooking, "Un-Recipes for Partners Who Can't Cook," and "Galacta-what? Recipes to Support Breastfeeding." It also gives new moms tips on how to stock her pantry, which cooking tools and gadgets to buy, and how to shop with a baby. In the "New Mom's Pantry" chapter you''ll find lots of satisfying, simple, one-pot wonders and pasta dishes such as Smoky Split-Pea Soup (perfect for baby food), Spaghetti Alla Puttanesca, and Southwestern Polenta Lasagna. "Nap-Time Cooking" will no doubt be the most popular among most new moms. Once the baby's asleep, Koening helps you dice and slice like a pro. You'll find recipes for Zucchini and Spinach Risotto, Indian-Spiced Black Lentil Stew, and more. And on those days when Sweet Pea won't stop crying, and you have to carry him around all day, Koening even has a tasty selection of "One-Handed Meals," including Chicken (Pot) Handpies, Meat Pasties, and BBQ Chicken Empanadas. You still wonder, Will the recipes really work? Yes. How do I know this? Because the recipes were tested by a group of more than 100 parents! Indeed, you'll appreciate (and sometimes chuckle at) the "Mama said" section at the end of each recipe that includes a note from a parent who made the recipe. Conveniently, every recipe also has instructions to make baby food from the same ingredients. If it seems that Koening has anticipated all of your new-parent eating dilemmas and come up with tasty solutions for you, it's because she has. It's called Parents Need to Eat Too, and if you click here, you can watch of video of Debbie Koening telling you more about it. There's more! If you order the book before February 21st, you'll receive a FREE Digital Starter Kit with bonus recipes, a guide to making baby food, a bookmark, and more. In the comment section below, tell me why you'd like to win a copy of Parents Need to Eat Too. Tweet about it and mention @Susan_Russo, and I'll count that as another entry. I'll announce the winner on Monday, February 20th. Good luck! This book sounds great; I could use some "one-pot wonders"! I enjoy Debbie's blog and so I am sure I will like her cookbook too! As a full time working parent who struggles to eat healthy and get a healthy meal on the table for my kids too - she has had some good recipes on her blog! I look forward to seeing the cookbook. What a great idea! I love to cook and my husband and I both fear that when our first little one shows up we'll have to suffer through with shells and cheese. I'd love to have this in our arsenal so that we can satisfy our bellies and hearts while surviving the newborn stage. I'd love to win this for my sister in-law. She's pregnant with her first baby and I know this would be great for her. As a mom of a breastfed 9 month old who is also a full-time teacher, I have eaten more than my fair share of Luna bars this year for lunch, and WAY more than my fair share of cereal for dinner. I would love a copy of this book simply to get me out of my Luna bar/cereal rut! Just as you said, the baby is eating wonderfully, but I'm eating frozen pizza, and this is not sustainable! I wish I'd had this book five years ago! I could still use some one-handed cooking ideas...so I can play with legos while I make dinner. I want to gift this book to a dear friend and new mom who gives of her self in a million ways (her husband, her baby, her family, her friends) and who is on a journey to give EVEN MORE while she pursues her therapist license ... but between the new babe and the hours she still has between herself and her license, doesn't always have the time she needs to take good care as amazing care of herself as she does others. As a Mom of 2 little ones I could use a book like this to make sure we get to eat too! What a fantastic concept! My best friend just had a baby! She loves to cook but she hasn't really gotten back in the groove yet. I bet this book is packed with recipes she can whip up while still keeping an eye on the cutie-pie! My sister is about 6 1/2 months pregnant, and I would love to be able to give this to her for when the new baby gets here! You got me at nap-friendly recipes. LOL what a great idea for very tired mums. I would love, love, love this book! We really don't think about ourselves when it comes to eating. All about the kiddos! be a first time Mom in just 6 weeks. What a great idea for a book! This would be so great for my sister who is expecting her second baby! I would love to win this book--with two children under two years old, we could use it! I would love to win this as a mom of two including a newborn and a toddler! fabulous! id love to read the section on breastfeeding chapter! my husband is sure tired of eating spaghetti every night! lol! Congratulations, Danielle! You're the winner of the book. I hope your sister enjoys it! Please email me with your name and mailing address so we can send you the book. Thank you to everyone who participated. There will be many more give-aways, so better luck next time!